It’s the elephant in the room for many hard-pressed regional daily editors: when and where to slash worthless features. With tighter pagination and fewer reporters, it’s surely the only way to increase the quantity and quality of local news, which everyone knows is what readers want more than anything else. I don’t mean ‘kill all features’, of course – there are sometimes good, in-depth interviews on local issues that fully deserve 800 words and three well-composed pictures. But just consider the amount of space that dailies waste on feature items that have little or no local content, and that are merely weaker versions of arts, lifestyle or soft consumer stories that have often appeared elsewhere. This all came to mind when I spent 45p on Northcliffe’s Bristol Evening Post on Thursday 16 February. I want to tread carefully here: I’ve met BEP editor Mike Norton, respect him and think his paper’s news and sports content is pretty strong. More of that later. But the BEP’s features pages on that Thursday were a good example of the waste that can be seen in most regional dailies. In the eB (entertain/Bristol) pull-out on 16 February, page one was a magazine style cover with a singer’s picture filling a third of the page, and no stories other than four picture write-offs. 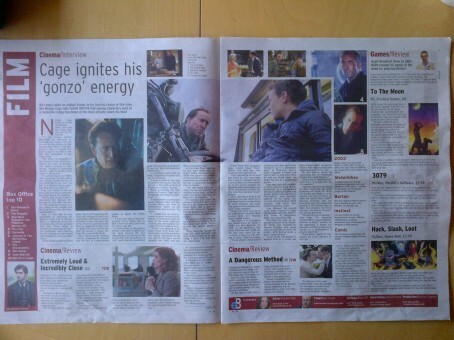 Pages two and three contained three film reviews of the latest box office hits – with no details of where and when they can be seen in Bristol. Who turns to their local paper to find out about films that have been previewed everywhere else in print, online and on air? The end double-column leg on page three was filled with computer games reviews; hands up who reads these in their local daily? Along with CD and book reviews, the majority in local papers are only read by those who write them. Page five was mainly filled with a 29-par interview with a minor comic; in fairness, he was local, but how many readers are riveted by a Q and A with a fringe stand up? Pages six and seven contained a 39-par interview with an Australian actor; the play he’s in was about to open in Bristol, but 1,000+ words on an Ozzie thespian was a yawn. So it continued throughout the 16-page eB: long interviews with actors, singers and chefs, and two-thirds of a page reviewing an art exhibition. There were ten more features pages outside of eB – with a 44-par review of a two-day trip to London another prime example of wasted space. All of it – or certainly most of it – could well have warranted tight page leads, succinct end columns or crunched kickers, perhaps together with local listings crammed into a high value ten-page feature section. But 26 pages of stretched, mainly PR copy, much with only tenuous links to Bristol, meant a story count of 60+ in features, with just 67 stories on 24 news pages. That balance didn’t feel right. Just think of what could have been done with 16 extra full pages on news and sport – and with reporters previously concentrating on their cinema/theatre/gig/recipe/travel hobbies instead reassigned to deliver real local stories. The features debate aside, the BEP’s front page splashed on a very readable ‘Menace on our roads’ exclusive, a shocking tale of a driver finally jailed after flouting a driving ban 21 times. The picture was also good, capturing the moment a detective told the world of the chilling Thornbury vicar murder – jogging the memories and interest of readers who’d seen the image on TV news from the night before. 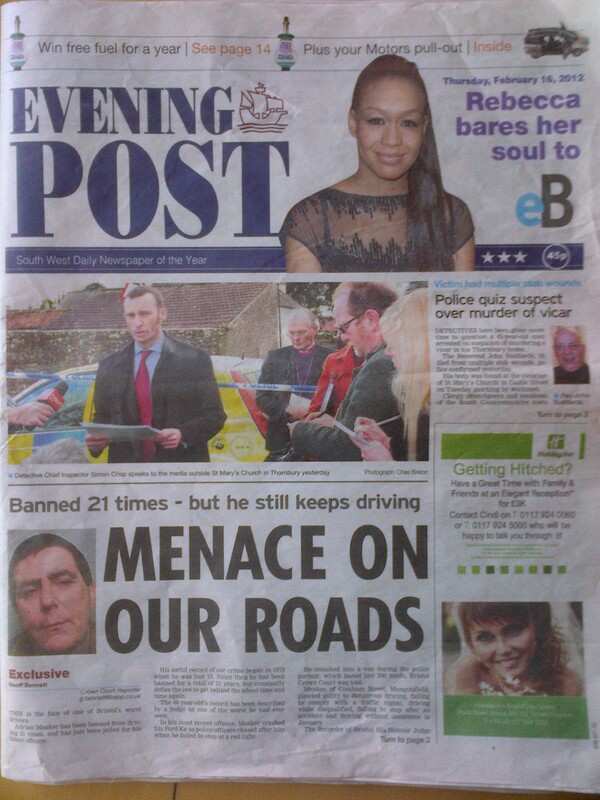 My only page one criticism was the X-Factor star dominating the masthead. Yes, she’s pretty, but Rebecca Ferguson is from Liverpool and didn’t deserve the near two pages of space she received here and in eB just because she’s appearing in Bristol in March. Inside, the local news agenda was strong: a road rage head-butting on page five; sickness bugs closing hospital wards on page seven; a row over new bendy buses on page eight; a builder fined for anti-gay abuse on page 13; and a dreadful baby battering case on page 16. Other positive highlights included ‘On the beat’, a well-written bobby’s column on page 10, and ‘The birth of’ and ‘The Life of’ above ‘Family Announcements’ on page 36, the first carrying a new-born’s mini-biog, the second a thoughtful local obituary. And in a compact ten-page sports section, three pages were devoted to valuable lists of hundreds of local football fixtures and 98 league tables all the way down to under-9s. A couple of irritations: too many page leads were used across spreads in news, resulting in six awkwardly split pictures; sport looked better with no leads spread, and therefore no pictures split. And ’24 hours’ was emblazoned on 2cm page top straps across all news pages, changing to ‘Focus’ and then ‘Highlights’ on the ten features pages outside of eB, making no sense to me; in sport, they used ‘Sport’, which worked. These small negatives could easily and quickly be improved in a paper that still felt it had some good content and direction for the 38,344 people who buy it every day. The real challenge – like for many regional dailies – would be to sacrifice some overblown features that few want for more detailed local news that can’t be found anywhere else. While I think Steve often champions the banal, he’s spot on here. Not to demean features staff, but many of the features they produce are niche at best. On a well-staffed newspaper of even 10 years ago, this would be fine. Today it’s using a precious resource to satisfy a very small section of the readership. Of course we want variety in our local media, but all this and more is obtained elsewhere and local staff should focus on unique content in these austere times, not content that can be got elsewhere. Steve is right. With tighter paginations and fewer reporters, tough decisions need to be made. It’s eminently sensible that Editors should review their products and sacrifice coverage of some issues in order to improve the coverage (both in terms of quality and quantity) of cover other topics. Features still have a place in local papers but, like everything else, when space is at a premium you have to make it count. Readers love features, they just don’t necessarily know that is what they are reading. It’s a word that means little outside of the newsroom. What our readers want is a good story told well and told about people. Sometimes that’s a 12-par news story, other times it’s an 800-word interview. As long as it’s written well, to an appropriate length for its subject and audience-targetted it should draw people in. Look at TV – what are ratings winners One Born Every Minute, Loose Women, Come Dine With Me and Question Time if not some form of feature? With more readers choosing to look online for the day’s headlines, news reporters and editors should be thinking more like features writers – more in-depth analysis, more case studies of people affected by the issues in the news, more new, longer-lasting angles for stories that are your exclusive for only about 15 minutes before every other paper, radio station, TV news programme, website has picked them up. There’s still a case to be made for Northcliffe centralising content like this itself, saving on features costs and cutting out the PA fee. As for the film reviews, recipes, beauty and more travel, I guess it’s one way to ensure that PA stays in business for when you really need them. But don’t forget folks, without those two-day “press trips” to London and week-long jaunts to sunnier climes further afield, the book reviews, CD and computer game reviews, where would the hacks get their much longed-for freebies from? Get real Mr Dyson. You need to spend a week in the average local newspaper newsroom to know that there are not the resources for reporters to dedicate hours researching local stories. You refer to the entertainment section of the Bristol Evening Post with the numerous nationally based reviews etc. Where are the reporters who have time to generate truly local copy for this? Your alternative of reassigning reporters to deliver local news wouldn’t work either – those local news stories wouldn’t look too good inside the entertainments supplement would they? Don’t forget the decision to produce such a supplement is not, in most cases, within the remit of editorial – it’s an advertising led decision. Perhaps Mr Dyson when you review newspapers in future your research can also include the number of editorial staff producing the publication. As features editor of the Cambridge News I’d say Steve Dyson is partly right… certainly about the amount of non-local, blatant filler feature content clogging up a lot of regional papers. Here at Cambridge we have a brilliant features team – if I do say so myself – dedicated to producing fantastic longer reads that get under the skin of local people and issues – the keyword being local. A good example is our recent interview with the woman raising her child “gender neutral” – a totally off-diary story, originated by a feature writer with a nose for an interesting subject and good contacts within the community – that made headlines around the world and became the focus of countless TV and radio discussions. That would never have seen the light of day without a features department because there was no obvious ‘news’ hook to hang it on, other than: here’s a person with an interesting point of view, let’s talk to her. If there is an elephant in the room, though, it’s Steve’s curious notion that newspapers relying purely on news content is a viable way forward. Surely as people increasingly source news in other, more immediate ways – whether that’s through local newspapers’ own websites or the likes of Twitter – the ink-and-paper version is going to have to offer something more. This should probably include greater analysis, context and background information about the news stories themselves, as well as added-value material to help readers get the most out of living in their communities. Which means the features team might just become the editor’s new best friend in the years to come. I read all the comments apart from the long-winded one from the features editor. Maybe that sums up why Steve’s right? Laura Davis, I love you. (And, at a push, Paul Kirkley.) Excellent points, brilliantly made. Let’s hope the right people read your comments and take them to heart. If Dyson’s argument is that features waste space, I’d like to ask: space for what? I’m sure we’ve all seen newspapers struggling to fill their news pages, resorting to nibs about cake sales or reader poems… I’d prefer an interesting, in-depth feature, thanks. What about the tautology in the sub-head: ‘he still keeps driving’…? JH – Steve clearly isn’t arguing that features waste space so why speculate that this is his proposition? It’s not only local papers who appear to be willing consumers of whatever the PR industry is seeking publicity for. National broad sheets, particularly at weekends, have regular features, eg “my favourite weekend” by an actor or writer which invariably conclude with a puff for a film/play they are appearing in or a book they have published. It certainly invites a cynical reaction on the part of the reader. Most readers of local papers in my experience do not want endless hard news or endless anything else. They want a varied and readable package. The most sought-after readers are those who pick up a paper every publication day without glancing at the front page headline or the goody box. They are the ones who trust the paper to provide a decent package every time. I imagine Steve Dyson has already contacted Hold The Front Page, urging them to ditch this column too. ‘Billy’ is spot on – I did run features at the Mail in the late 90s. The biggest challenge by Ian Dowell, the then editor, was a daily page six and seven spread to captivate readers, always a local story, but in depth. That’s what was crucial, not generic/national features. Similar response re. the comment from ‘A worthless features writer': it’s the types of features, not features per se, ie, Holdthefrontpage wouldn’t run my blog if it concentrated on national newspapers. The site is local/regional, and so the blog highlights/analyses that area.